Nokia began her history from rubber products. Before they became mobile phones market leader they produced TV sets, Videocassette recorders and other electronics devices. Nokia was like Samsung five years ago. They produced many things but they aren’t leader in any area. Finnish manufacturer began adventure with robotics in 1966. Then they signed agreement with Unimation to sale theirs robot in eastern europe and soviet union. 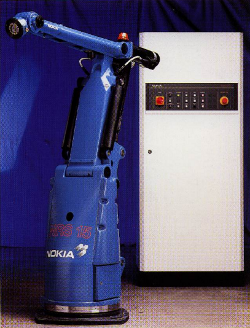 In eighties Nokia acquired licenses from Unimation and started production of their own PUMA robots. Arm was copy of Unimate PUMA 560, but controller was designed by Finnish people. Also software was different from original one. 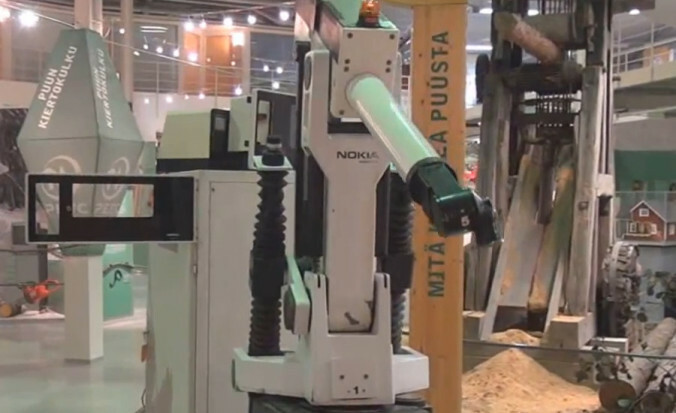 Nokia made about 1500 pieces of robots destined for CCCP. Besides NS-16 Nokia introduced to market model NRS-15. It was specially designed for welding applications (but was also suitable for material handling, palletizing, assembly, and packaging). NRS-15 had 5 DC servo-controlled axes and can lift 15kg. Maximum speed was equal 3,3 m/s (during linear movements: 1.5 m/s). Nokia adventure with robot production last nearly ten years. Finnish corporation sold their Robotics division in 1990.